Thomas William Landrum is a former right-handed Major League Baseball relief pitcher who played eight seasons with four teams, the Cincinnati Reds, Chicago Cubs, the Pittsburgh Pirates and the Montreal Expos from 1986 to 1993. 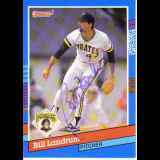 Landrum finished sixth in the National League in saves with 26 in 1989 and had a 1.67 earned run average that season and finished seventh in the NL in saves with 17 in 1991 with the Pirates. His father Joe Landrum pitched for the Brooklyn Dodgers in the 1950s. Thomas Landrum has retired and lives in Columbia, South Carolina. New Response (Success): Signed 1993 Kahn's card.